Knights of Creativity Spirit & Ale: The Key to Success? I’m obviously way behind the times. I just noticed the other day that Coors has introduced something called a “Vented Wide Mouth Can” (I also missed "National Venting Day" on April 15). What? Over half of beer drinkers don’t like the way their beer pours from a can? I don’t mean to tell Mr. Dolan his business, but I’ve NEVER had a problem pouring a beer from a can (okay, maybe late in the evening after a few). This “new and improved” can reminded me of an essay that I read 30 years ago in college English 101: John Updike's The Beer Can, 1964 (Editor’s note: I was only 4 when this was written, but I guess my college professor was to too lazy to update his reading list from the 60s). 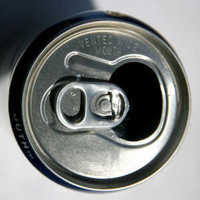 Remember, this is when the pop top can was first introduced. This seems to be the era of gratuitous inventions and negative improvements. Consider the beer can. It was beautiful -- as beautiful as the clothespin, as inevitable as the wine bottle, as dignified and reassuring as the fire hydrant. A tranquil cylinder of delightfully resonant metal, it could be opened in an instant, requiring only the application of a handy gadget freely dispensed by every grocer. Who can forget the small, symmetrical thrill of those two triangular punctures, the dainty piff, the little crest of suds that foamed eagerly in the exultation of release? Yes, I have to agree with Mr. Updike: beer never flowed so beautifully as from a can opened with a “church key.” Even after the pop top was invented -- back when cans were still steel -- you could flip ‘em over and open them with an opener. Damn aluminum! 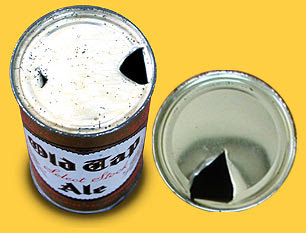 In 1935, beer in cans with flat tops was marketed, and a device to puncture the lids was needed. 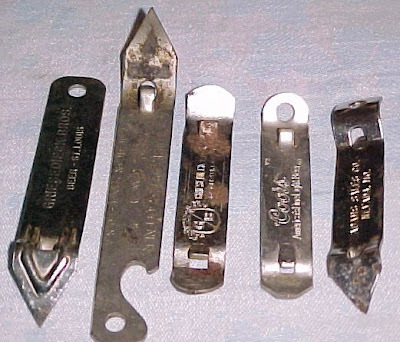 The same ironic term, "church key", came to be used for this new invention: made from a single piece of pressed metal, with a pointed end used for piercing cans — devised by D.F. Sampson for the American Can Company, who depicted operating instructions on the cans themselves, and typically gave away free "Quick and Easy" openers with their newfangled beer cans. The Vent Can? 44 years later Mr. Updike is right again: This seems to be the era of gratuitous inventions and negative improvements. the two that stand out and annoy me no end...is the toothbrush industry and the shaving razor industry. both play similar tricks of updating at Christmastime. I have hung in there with this model, as so far they haven't deleted these attachments off the shelf ...yet. They are getting hard to find tho. Since then i have noticed a 3 bladed Turbo ..what the hell is Turbo in relation to shaving?? ...........then they came out with the 4 bladed version..and i swear blind i saw an Ad the other day that not only had 5!! blades in the attachment...but now had a battery in the handle so the whole thing gently Vibrated!! what the FFFF!!!??? hmmm you can see i get quite steamed up about this...i better mind i don't cut myself shaving. I remember when Coors came out with a wide mouth can a couple of decades ago. That was for easier drinking from the can, instead of "for the pour". Nothing is new, just repackaged. The key would have made a great prison weapon. I wonder what they let the inmates use to open cans back then? Also, it comes in handy when you're checking out at the package store and you run out of money. Just pick up your free key, stick it in the attendants face and run like hell. Perhaps that's why the "pop top" came into being?